The Goju Ryu Kenkyukai is very friendly, and values Sensei Taira, So when we go to seminars, people bring gifts. Cool. That's very nice. He does value the sentiment. But, we're here to train. Sensei likes a drink, he likes to socialise. But he's there for 5 days. 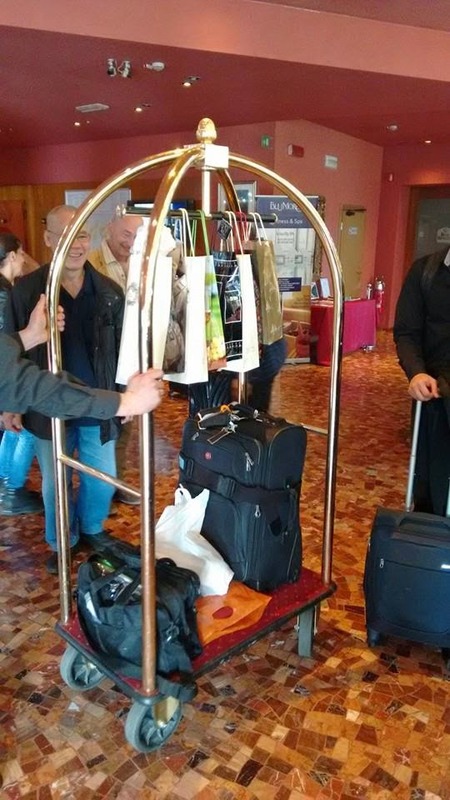 Look at the picture, there's 8 or so bottles of booze on the that trolley. So - if Sensei drinks all that, there won't be much training. If he doesn't drink it all, he's not taking it home on an airplane. There's a limit to what he can take into Japan. There's a couple of other things there on the bottom shelf, gifts that weigh a kilo or more. Sensei travels with a small bag! And if you've trained at Sensei's home dojo - it's small and already a bit cluttered!